If you play a warrior, the constant hissing sound of this permanent buff quickly gets annoying. By default KOA:R uses low quality anisotropic filtering to give better performance. Game profile names need to be identically named when transferring saves to different accounts or computers. If they are not, then you will need to rename the save file into one that has been 'recognised' by the game. This applies to transferring save data in any combination between computers, profiles, Steam and Origin accounts. Syncs up to 1 GB of data online. Syncs up to 1000 MB of data online. Quest menu is not visible in 4K. Fix addressed in Widescreen Fixer but not functional. Launch Widescreen Fixer and open Kingdom of Amalur's plugin settings. Set desired field of view (recommended value: 60-70). Set a keybind for Widescreen Fixer. Press your FOV keybind before doing anything else. Your FOV will expand from a shoulder-cam to third person at the correct FOV. Should this greatly distort your image, simply reload the save and the FOV setting will take effect. Changing mouse buttons may cause problems. Using an Xbox One controller may cause severe stuttering. UI fluctuates when using more than one input. Input may hang when switching. 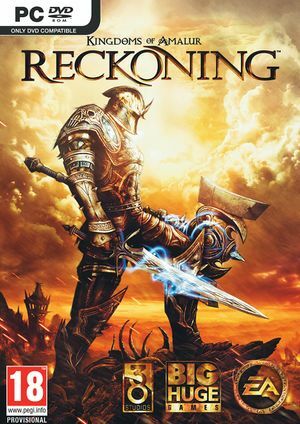 See Helix Mod: Kingdoms of Amalur: Reckoning. Mouse button binding causes problems. The Xbox One S Controller, when connected via Bluetooth, causes the game to severely stutter, leaving the game hardly playable. A workaround is to use the controller in wired mode. Caused by a weird interaction between one version of XAudio2_7.dll and the on-screen keyboard service. ⊞ Win+R and type msinfo32 and ↵ Enter. Create the batch file above by replacing the <path-to-game> with the path to the installation folder. Save as a .cmd and launch it as an administrator. To simplify that, you can create a shortcut to the .cmd and choose Run as an administrator in the shortcut's advanced options. The demo shows nothing but a black screen with AMD GPUs. This issue is not present in the final game. Search for the following hex-values : "A5EE1700"
Greatly increases game difficulty, as vanilla can be too easy late-game. The changes are listed here. Includes PDF game guides and developer interviews. ↑ 1.0 1.1 File/folder structure within this directory reflects the path(s) listed for Windows and/or Steam game data (use Wine regedit to access Windows registry paths). Games with Steam Cloud support may store data in ~/.steam/steam/userdata/<user-id>/102500/ in addition to or instead of this directory. The app ID (102500) may differ in some cases. Treat backslashes as forward slashes. See the glossary page for details. This page was last edited on 24 January 2019, at 08:23.